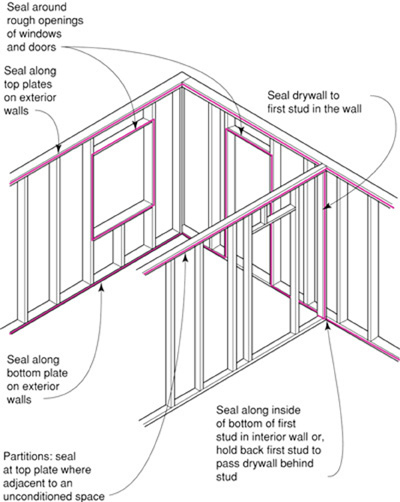 Builders can detail a house’s air barrier in several ways. By taping sheathing seams, the air barrier can be established at the exterior wall and roof sheathing. Using spray foam, the air barrier can be established inside the wall and ceiling cavities. 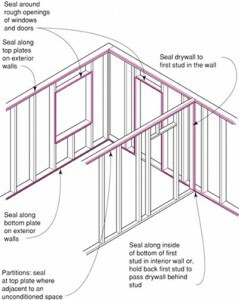 Or the air barrier can be located on the house’s interior by using polyethylene sheeting or by implementing the airtight-drywall approach. Building scientists now realize that in all but the coldest climates, interior polyethylene causes more problems than it solves, so builders who favor interior air barriers usually choose the airtight drywall approach. If you climb into the attic of an average house during the winter and pull aside the insulation above a partition, you’ll discover warm air rising through the visible crack between the drywall and the top plates. Air usually enters partition walls through cracks atelectrical boxes. 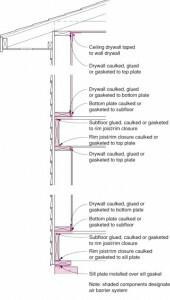 The airtight-drywall approach addresses these cracks, as well as others. A wide variety of caulks can be used for airtight drywall, but most experts recommend poly­urethane for sealing drywall to framing. 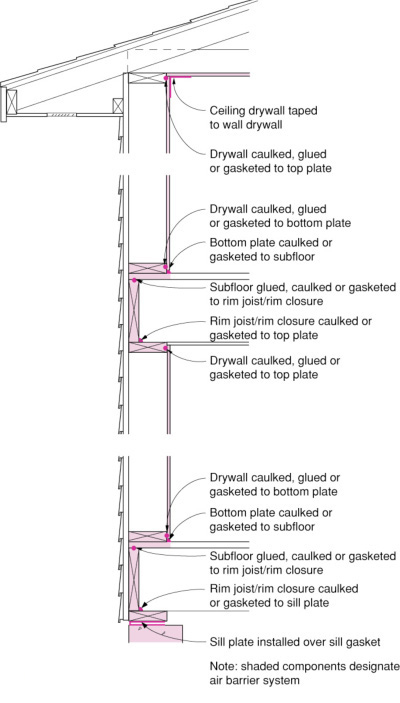 Gaskets, however, outper form caulk in this application. At least three types of gaskets have been used successfully for airtight drywall sealing; open-cell foam gaskets, EPDM gaskets or gaskets that are made from ripped lengths of foam sill seal. You’ll also need airtight electrical boxes. Most include a flange that helps to seal the gap between the box and the drywall. 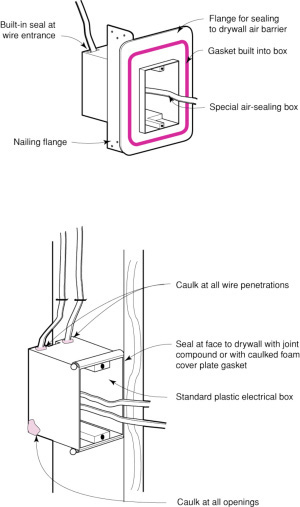 Some airtight boxes have flanges with an integral gasket, while others have flanges that are designed to be caulked. 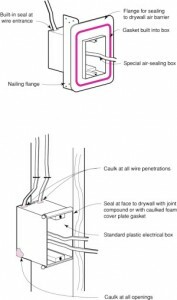 In addition to sealing the crack between the box and the drywall, it’s also important to use caulk or spray foam to seal the leaks that exist around the holes in back of the box where the electrical cables enter. It’s important to keep in mind that filling in electrical box full of spray foam is a code violation.